"Le pagine di S.S., che non si possono spiegare"
The image is a LINK to the Jimdo page where "Two sunrises and two sunsets at IQ1RY" lives. It is a short PDF set of slide describing my experience of the JARTS 2013 from the IQ1RY premises. Enjoy. ... by files families and functions, as to free the main deployment directory for this great, free, logger. By now it is all maintained by hands, in the hope this could become a standard feature. TU to all for this great contest. made uneasy to fully operate the contest as I planned, SO2R on a single PC. several times on the noisy 40 e 80 meters. The second night I almost sleep due to this. Great contest, nice peoples and a lot of lessons to learn: what's better? right way. Don would you check please? QTC's and I was really happy to stop it all  and try with him in another way. gain for another guy at last, that's great for me. to have again ours half of the fun. Yes, I was operating from the IQ1RY premises as SO2R, first time in my life. As I already stated it was a lot fun. Now I will try to replicate all this in the WAE, something more heavy to, isn't it? For sure it is more heavy, 36 Hours as SO2R instead of 24, the need to make the right choices against contest timings, propagation, log grow up and much more things that are to be strategically and tactically to be considered. My elmers already settled me up and loaded of great ideas and suggestion, now it will be my time with some attention, horse powering and my ingenuity. Directors - July 15-16. 2011"
decision taken inside that document, as seen here in the abstract. many variations of digital communication ...", tells by itself all. only an awful envision at best. grave and nobody know how many of those we have to spare. barefoot. The RUN routine went quite flawless but not before almost 21 UTC. TEST or even DMC string may have solved at all this issue, but again no way. need to remember this. Yes, 20m during the NAQP went very well, for sure. we have had also something interesting to do on 40m. But not so much unluckily. May be this season marked its hole about. contest tasks are another history. really hot WX here, so it was a pleasure not to have the PAâ? ?s running nearby. everywhere, thanks to all for all for the Qâ??s! not so well sounding tones. period, sorry for who didnâ? ?t come out from any hole to us. much signals. This was quite expected. Qâ? ?s, another load of DL's! strong skip was also there. helped and give us some relief, but not every time. difference. It's quite usual and well expected, time to time it could happen. efforts that doesn't end now. They will have just from now their time! Well, CU all in the 2011 results and than in the 2012 for the DL-DX! 73 de iw1ayd, Salvo: one of the IQ1RY Team. Well: we win our category! Volta contest and some more after since we get an helping hand from K3CT. sometime it was too much quite to be dead on. had was John K3CT, TU John! You deserve all yours gratefully thanks. our results. WOW! What a bunch of blasts! Itâ? ?s radio, itâ? ?s ours world. TU Mario IK1HXN, TU Filippo IZ1LBG, TU Renato I1DEP. TU to all the IQ1RY team that is working for those results. But last but not least TU all, hope to CUAGN in other contests! This is an abstract from the whole PDF. can‟t seem to shake the second-place jitters and took it again this year. Then it was the Europeans with a bunch of new faces in the Top Ten. UT7E was third. OH8KTN was in fourth and IW1QN fifth. all-European-dominated group. Hector, XE2K with just packet assistance won top honors this year. year will likely be better. Abbandonato - 150th country reached on LoTW by IW1AYD, TNX to all! Il DXCC RTTY Award NON esiste più. E' diventato DXCC Digital Award: se lo possono tenere. Non viene più perseguito dal sottoscritto. I miei log verranno comunque caricati su LoTW, ma ormai senza più scopo o interesse personale. Scelta pessama. Impostazione da venditore di fumo della ARRL. Ovviamente SOLO RTTY o comunque data modes, qualcuno anche in WSJT e PSK31 con il dipolaccio multibanda sotto il tetto e /QRP. Solo RTTY chiederete? Si, rispondo, perché esiste altro? Obviusly only RTTY, some also in other data modes, WSJT or PSK31 with only a multiband dipole under the roof and /QRP. Someone would ask why only RTTY? Yes, I answer, is there something different? Many TNX to IZ1TNL and her patience and efforts supporting this strange Husband. Operator(s): IK1HXN, IK1SPR, IK1RQT, IZ1LBG, IW1AYD, IW1QN, I1BEP, IW1FNW. So, the Game of the games it's over for this year. it went for us and ours new M/2 setup. listened, the crowd was terrible time to time. Somebody have had so much patience, tnx. This was the first year for IQ1RY as Multi Operator Two transmitters. and move onto the new setup just done for this M/2 roundup in CQWW. Everybody learned his lesson and we hope to share all of those â? ?on the jobâ?? any possible way to improve. in the contest and to reach at least 3400 QSOs. suddenly switched out, several trains trespassing on the nearby railway. and shared at the end of the airtime. the RTTY sound and all those friend callsigns we meet on air. to have such a big fun as this. Special congrats to IK4MPG, IT9BLP and DQ4W team. IQ1RY operators: IK1HXN, IK1SPR, IK1RQT, IZ1LBG, IW1AYD, IW1QN, I1BEP, IW1FNW. hour much more than before. really hard to listen from this side, but all went in a friendly way. over a great and sweet cake. We were honored by two guest operators, Maurizio IV3ZXQ  and Alberto IV3BSY. than before. It's nice and well done from ours standpoint. It was a nice WPX 2011, see you all with IQ1RY in the next contests. Fom SJ2W Contest Station - it tells all by itself!!! We win again, thanks to all the participants and to our work. I learned again several lessons during this fun job: TU MARIO IK1HXN CU IN CONTEST! We went to the Italian CTU. IR1ITA activation: 150th birthday of Italy as a nation. Sponsored by IQ1RY team and IK1SPR. IW1EGO is dismantling his actual antenna farm and rebuilding a new one. ... and maybe several other thing that I am forgotting. Manned by Mario IK1HXN & Salvo IW1AYD, the club station by the ARI section of Bra wins the 2010 edition of the VOLTA RTTY Contest. As WW-MO winners Mario and Salvo wish to thanks all the VOLTA Contest entrants. We are proud of this result together with all the OMs and YLs that are around IQ1RY. All this was done not only and alone by ours effort. We went there having the support from the whole group of HAMs that work each day for the club station. From the simplest job or task well accomplished to the more technical ones we have to thanks everybody of theirs respective work and effort. What we, manning IQ1RY for the VOLTA Contest, have done was enabled by the efforts of the whole group of HAMs here living and working since than. TU dear fellows and friends from Bra and the neighborhoods villages and cities. You are right Daniel, at all. The 1K-FA it's really touchy when driven without ALC. I have some experience driving it also with the PROIII and the FT-950, with the respective ALC well connected and it works more easily for sure. I could confirm and say as mine yours words and opinions from my side. I gained some compromise setups band by band after all my intense usage with my poor dipoles in a restricted town shack with a condo roof for aerials. It's not easy and during contest, at night, ... those happenings that you could easily leaved me so disgruntled that I was ready just for the bed. This is not to convince you to get back on FLEX, but just to say that yours problem isn't only yours. As somebody other have a managed to find out a solution. Actually all the major players are using a SDR core well surrounded by more traditional layout for ours toys. All this is more perfectible over time and with some investment. Also I hope that the market would permit to gain for us the ability to use ours best traditional setups with all the needed and seamless useful new features. The time will tell all to us. By now I would still continue to use my beloved FLEX, brought by me, and a guXX brought in by another operator for the multi single club station IQ1RY. Those vacuum tubes are steady as a rock and not touchy at all when driven even at full legal power for limited test purposes. At home I will stay more low, as US legal power will light neighborhoods lights and would illegal here. RTTY at 300/400W it's mine limit, 500W is the Italian hamradio operator limit for any class, not mobile. You know Daniel it's kind alike the food: each one, name one, have it's way to be better cooked around the seasons of the year not only by it's nature and kind. Flavor are different each time. Thank you so much for your input. I read all that you wrote with great interest. panoramic display like the Flex. Well, thanks so much for sharing your experience! From TS590 yahoo group - Re: Extra Filter Slots? I would associate my opinion with the same from Peter - HB9PJT. Clear points Peter. Also the last one it's clever: " We will see". One more point that I would give for discussion is that, citing the FLEX software and hardware architecture, a big enhancement in the filter shape occurs with bigger buffers. I mean those buffers in the DSP processor, as far as I know. This seems quite independent from the DSP algorithms used. I just leave the standard one offered by default. What I mean is that when I choose inside POWERSDR(tm) smallest buffers. As to decrease latency inside those buffers, let's say a 512 bytes buffer size. The filter shape degrades by any mean. RTTY signal nearby 100/300 Hz from a 230Hz filter leaks visibly on MMTTY waterfall. There is also the associated audible signal in the speaker. With bigger buffers, let's say 2048 byte, there is a perfect shaped effect with the same IF filter. No nearby signals at all. In RTTY or any other digital modes that is not CW I don't think that those IF buffers need to be so tight. And there are several other aspects to benefit the filter shape and the whole IF circuitry response, as peter wrote. I could associate also MMTTY BF processing after all. I have no doubt that as it's done by me manually, with the simplest cause and effects process, it could be done flawless and better by the firmware. This last would be made, i hope, around a drill down processing of all the choices involved in. But there is also marketing. Nonetheless, as this will be firmware controlled inside a 590 there is the possibility that something could go wrong. We have a lot of transceivers that looks really interesting but that are at least poor in real world performance. Not to say that some of those are good as door stop from perspective to perspective. By any means a single button action, a mode change to an AGC set, have several things to set and reset, code & data flow. I hope that there was no the wrong approach during the development of this so hoped and nice looking RTX. "We will see". The famous and over speak K3 have had and could have several changes on it's firmware. But the habit about is that everything is well done at any time and for any season. More a mental habit and perception than a real issue as for everyone other builder on the market. Lastly, SDR are the answer for today needs. But there are strengths ans weakness as usual. Different words than in the analog world but same final problems. Not speaking about the void of software and human interfaces. What we see is that all the commercial builders are, for the greater parts of the work done, approaching the soft way to SDR. But this is another story. Not just for the graphical integrated GUI idea but fo a lot more thing inside out. Not to be silly but just to trow in my 2 cents. Well, it's a bigger 44 cents coin at the end. Sorry for the rather long message, I hope it's clearly readable due by my poor English. Unfortunately I don't own any flavor of the FT-9000. It's quite out my target, well several of my targets. Nonetheless I am here and with other groups/mail to read the several interesting thing that come out every day. My experience on FLEX is really positive. Mine activities are centered around RTTY, both Contesting and DX chasing. I like also to have real QSO kbd to kbd or simply air checks with this or any other digital mode. No ROS. I have to admit that before of this radio I get almost acquainted with non SDR radios in half the time. The SDR took a lot of time just because there are so many switch, buttons and lists of values that I have had my time to get it running as smooth as I like. My latest try was with a FT-897 and is 300 Hz filter, just after reselling an FT-450. All went working in some hours, perhaps spreading the efforts over days. But nothing compared to the pure joy of the FLEX. I am using a dedicated and protected PC with W7 32bit(!) for the POWERSDR(tm)radio application with a FLEX-3000. 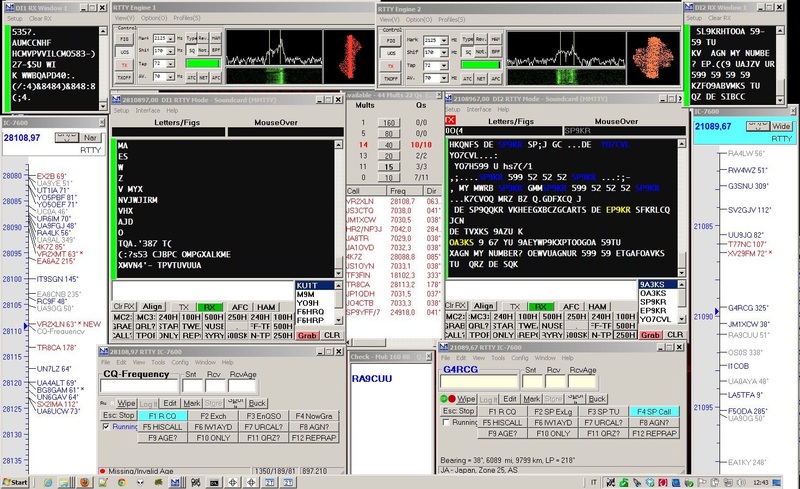 The software environment is completed by N1MM with MMTY or alternatively with MMSSTV, WSPR, WSJT. Last but not least Tmate help me a lot with the VFO fiddling. I have had hard times running the HRD-DM780-LOGGER trio, virtual serial port emulation is quite a nightmare. Now it is solved with mini deluxe, a stretched application that emulate HRD and permit to DM780 and the LOGGER to run flawlessly. The HRD Logger is still the main logger, with HRD utils it help me a lot sorting all electronic QSL activities. As a result s 26", 16:9, monitor is fully crowded mainly by the N1MM bits and pieces together with POWERSDR(tm). This screen is my radio and my radio is on this screen. Filtering and bandpass commanding is written inside CAT commands within the digital set of macro for the N1MM digital window: no radio touching is needed, all the operations are driven by the N1MM windows in focus. Quite the same thing went done before the advent of the FLEX, for filters and some other controls, with the PROIII/FT-950. Well, not all together, some in the N1MM and some in DM780, as needed by the different activities. I have done several RTTY contests from my small pistol shack, helped by a 1K-FA, the Tmate USB device, a trackball instead of a mouse and a multiband V shaped rigid trapped dipole by Create. I have also done, as with some new release the FLEX went more stable, some contesting from the biggest than mine shack of ours club, IQ1RY: astonishing!!! The FLEX 3000 is at least a good radio. I have have in view the band as I need. All is commanded via the N1MM macro buttons set. All is done almost via a mouse, seldom with the keyboard when not in a chit chat QSO. I just need to find a free spot, if there is one of course, to start a RUN session. Save the current QRG, look at the cluster when permitted or to the band in the panadapter to check out who is there to have a QSO more. He would be a multiplier, luckily, or simply another RUNner just to improve the rate. By this time not SDR software is almost integrated by CAT and virtual and physical serial ports. 1K-FA frequency/bands control was done routing the virtual serial port CAT also inside a physical port, by the way. During DX chasing it's almost the same. After getting the TX QRG of the DX stations it's just a matter of finding in a "view and click" a free spot UP to start calling. Having also the idea on whats going on even on my TX QRG and not only on the DX receiving QRG. This is similar to the double set of filters applied to the RX and TX QRGs VFO for YAESU. A different beast of what ICOM does. Tight filters are really tight with bigger software buffers. I couldn't cry too much about my old and trusted couple of PROIII with theirs one shot TPF. Nor with the nice filters of the FT-950. One thing that I have done is to retain the FSK style operations also in AFSK. The radio will be set dead on the RTTY tones, inside the RTTY filter, not clicking-clacking the mouse to get on the RTTY mouse inside the band pass. This is as FSK fixed radio must be used not AFSK ones. There is also a TX filter for RTTY, tight enough not to spread or spit everywhere unwanted tones. BTW I am running lower tones, mark is 1445 Hz. More pleasant to listen hour after hour, IMO. Another thing that I was doing is to enforce the whole setup environment as to use N1MM any activity, QSO & Contesting. I have learned, over time, a good knowledge of the N1MM environment. Forcing myself to use it anyway since the start of this SDR adventure. I have not to say again that I was maxed out to do this by the first unfruitful bunch of approaches with virtual serial port and the SDR. Things that someone others seems not to have had. The change from DX and QSO activities to the Contest activity "desk", of that time, I simple switch over the related macro sets. Then I engrave it in the database reload information. Each one of these is cooked as needed and will come alone up in the deprecated case there is any application shutdown. Those sets are for the input window. Digital modes macro with filters and general RTTY sentences are the same whiting the digital mode windows. Now I am quite a "satisfied customer", but still asking myself if there is the the real need to change anything out of the main antenna, something of a lack here in a dense urban area, to improve the general setup and, of course, the performances. I still look at mine other radios with pleasure and joy, PROIII, FT-950 and TS-870. I already get rid of several more new ICs and some older FTs (MP). I would also consider a Ft-9000 and is “smaller” brother the FT-5000. I will need something to fill in the portable operation hole. But no way since now, there isn't the right piece of hardware out now. Owning FT-897/857, IC-703, and TS-480, for portable activities, doesn't help too much, also with 500 Hz or 300 Hz filters (remember RTTY!). I see to buy a portable PC to have smooth operations with the 3000 another nightmare that I wouldn't like to start by now. May be the 1500 should be a good starting point, but ... by now I have other priorities. I am in view also for the HPSDR project, the mercury standalone board. Actually it lacks the software facilities side, no CAT, no serials, in one one a good experiment but not to much a radio for the everyday use. May be there are several aspects on witch I get so acquainted and that I even forgot to write all down here. ALC, RTTY TX filter and so on. There could be possible bunch of issues on some of these forgotten things but those last are quite working/solved here. At least I was lucky to find out the mix and max of related adjustments, for now. This work is licensed under a Creative Commons Attribution-NonCommercial-NoDerivs 3.0 Unported License.nza Creative Commons Attribuzione - Non commerciale - Condividi allo stesso modo 3.0 Italia. DISCLAIMER - NOTE DEL CASO - PER CHILOMETRI E CONSUMI VARIABILI. Questo blog/sito/insieme_di_oggetti_o_contenuti NON rappresenta una testata giornalistica con cadenza periodica o aperiodica. NON è da considerarsi un mezzo d'informazione o un prodotto editoriale ai sensi della legge n.62/2001 o di ogni legge, circolare, pezzo di carta, scritto, parlato, sussurrato di e da qualsiasi provenienza (*). L’autore non ha alcuna responsabilità per i siti segnalati; il fatto che il blog fornisca questi collegamenti non implica l’approvazione dei siti stessi, sulla cui qualità, contenuti e grafica viene declinata ogni responsabilità. il "mettersi d'accordo" significa che si fa quello che sembra sano e di buona comprensione reciproca, non quello che vuole una o l'altra parte, me NON compreso. Stretta la foglia, larga la via, NON dite la vostra, ho detto la mia. * Ciò per evitare rimescolii nascosti, triviali e gratuiti che subdolamente siano avvenuti, avvengano o avverranno, da ogni e qualsiasi dove, per ogni e qualsiasi ragione. Sta roba, scritta, cantata, ballata o altro, non conta nulla, come TUTTO il resto, salvo le note del caso o il disclaimer: ve lo ficcate in testa una volta per tutte!!! Ah, dimenticavo, qui questo cosucce sono scritte in Italiano, Italiano ok(? ), valgono scritte così, no translations thanks in advance. Chi vuole capire, capisce, chi non vuole capire, non ha speranza di capire. 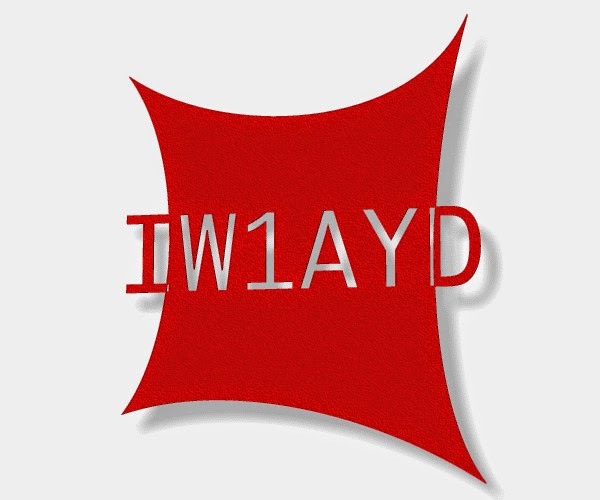 IZ1TNL & IW1AYD. Awesome Inc. theme. 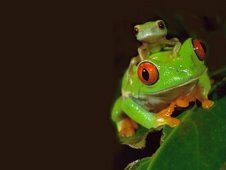 Theme images by fpm. Powered by Blogger.